Alive and Well Communities believes that in order to disrupt persistent disparities and cycles of trauma, we need the combination of a grassroots movement and organizational transformation. These efforts support and inform one another and in combination allow communities to begin to heal. Individuals who live in our communities choose to become Ambassadors to lead and guide the work. Ambassadors elect a steering committee to lead the work in their regions, which can include building a common language and understanding, creating opportunities to build supportive neighborhoods, and advocating for changes in policies or practices that are perpetuating trauma. For organizations and systems, Alive and Well provides a range of training and consulting services to help organizations move through the stages of change outlined in the Missouri Model: A Developmental Approach to Trauma. The Missouri Model has four stages of change: trauma aware; trauma sensitive; trauma responsive; and trauma informed. The model centers around five key principles to aid an organization’s progress: safety, trustworthiness, choice, collaboration, and empowerment, which when addressed comprehensively leads to equity. By focusing on this developmental approach, Alive and Well’s consulting services help organizations effectively create long-term, sustainable cultural change using the latest science around trauma, toxic stress and resiliency. We believe that when organizations and communities build this common understanding of how trauma and toxic stress impact individual and community outcomes, we can work together — rather than blame one another — to create Alive and Well Communities. Alive and Well Communities is a member of the Building Resilience Collaborative (BCR). BCR sees community resilience as an essential factor in improving public health outcomes. Community resilience originates from buffers in communities and families to protect individuals from the accumulation of stress due to adverse childhood experiences, such as exposure to emotional and sexual abuse, maternal depression, neglect or incarceration. 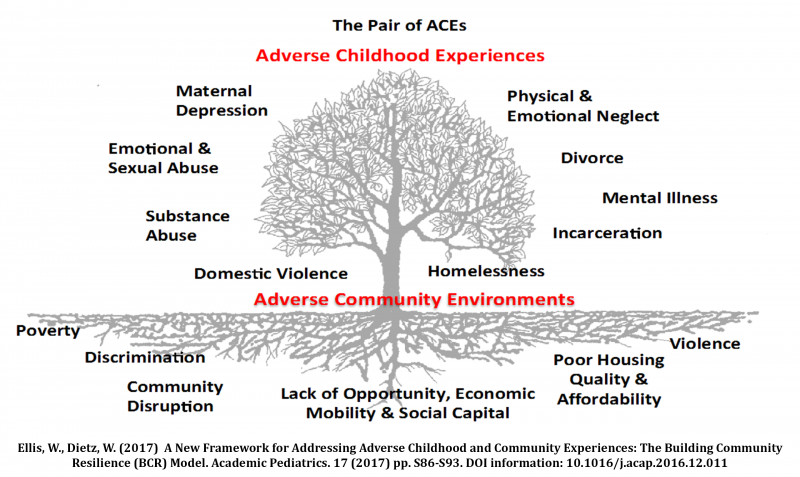 When these exposures are experienced in adverse community environments (ACEs), characterized by violence, racism, or poverty, for example, the effects are compounded and often lead to multi-generational stress and poor health outcomes.